This campground, under a majestic stand of more than 50 mature cottonwoods, is near the juncture of the Tongue and Yellowstone rivers and just six blocks from the downtown of this historic High Plains cow town. Take a downtown walking tour to see many frontier buildings listed on the National Register of Historic Places. Among them the Olive Hotel, where Gus died in the epic frontier miniseries, Lonesome Dove. 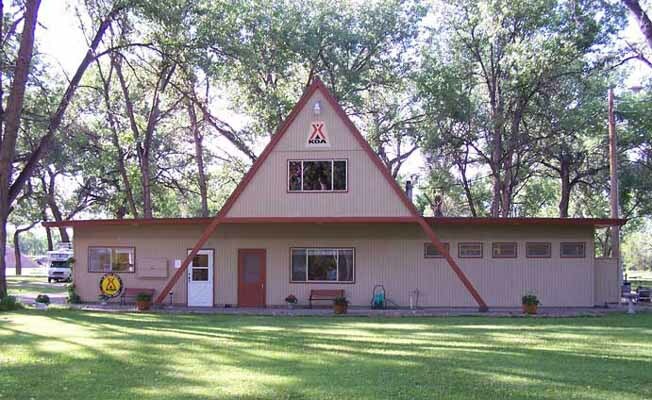 Campers fish in the Tongue and Yellowstone rivers (license required), swim in the heated pool, play horseshoes and relax in the social room. We offer Free Wireless Internet Access at the campground and cable TV. There is plenty of options for walking your pets. Miles City's Range Riders Museum, at the site of old Fort Keogh, showcases a replica fort. The Custer County Art & Heritage Center includes 19th-century photographs of Native Americans by Edward Curtis. Limited services available during the month of April until the middle of May. Miles City KOA is located from Interstate 94, take Exit 135. Go 2.4 miles, turn left at 4th Street, drive 2 blocks to Palmer, turn left again, and then it's just 4 blocks to KOA.Miles City KOA is located from Interstate 94, take Exit 135. Go 2.4 miles, turn left at 4th Street, drive 2 blocks to Palmer, turn left again, and then it's just 4 blocks to KOA.